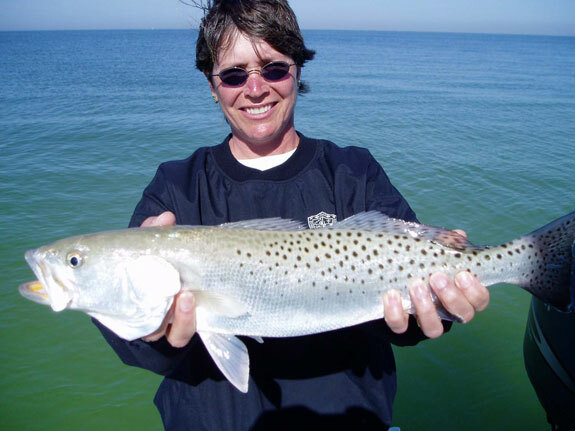 Spotted Sea trout are a highly sought after fish on the deep grass and sandbars surrounding Anna Maria island. They are fairly easy to catch on live and artificial baits. They are a schooling fish and once located can provide nice nonstop action. Drift fishing over grass from 2-8 feet and throwing topwater plugs is a popular way of catching and locating them. Trout are not exceedingly strong but can provide showy surface splashing fights. The size is usually from 1-3 pounds and commonly reach 4- 7 pounds throughout the gulf coast. During cold snaps the larger fish will find refuge in the deep canals and rivers in Anna Maria and The Manatee area. Weakfish have a similar silhouette to the spotted seatrout, but their markings are more faded forming irregular wavy lines instead of spots. They are located on deep grass and can be found on rocky areas on the beaches. Their size usually ranges from 1-3 pounds and like all saltwater trout they are excellent eating with mild and flaky fillets.